The expansion of early voting has not only made it more convenient for Americans to cast their ballots, but it has also become a tempting source of data to try to predict what might happen once the dust has settled on election night. In 2016, our analysis of the early vote was fairly predictive of turnout differences that helped define the election outcome —namely, while Latino participation surged, so too did turnout among white voters, while black voters turned out at a lower rate than they had four years earlier. This year, our reading of the early vote suggests a somewhat similar story: Minority turnout will be higher than usual for a midterm election, but the same is true for white turnout. That means 2018 will see a continuation of the trend toward a more racially diverse electorate, but the pace of that trend is not sufficient to power a “blue wave” on its own. As is well-documented at this point, early voting is up substantially from the last midterm election, but making sense of those trends requires careful attention to context. More and more Americans who decide to vote end up casting their ballot early, so we would expect that the number of early voters will rise even if overall turnout remains the same. A greater number of early voters in 2018 than the previous midterm election (2014) does not, on its own, suggest anything about which party is going to do better this year. Looking at the demographics of who votes early — such as race/ethnicity — might be a better marker, given the close connection between race and party. 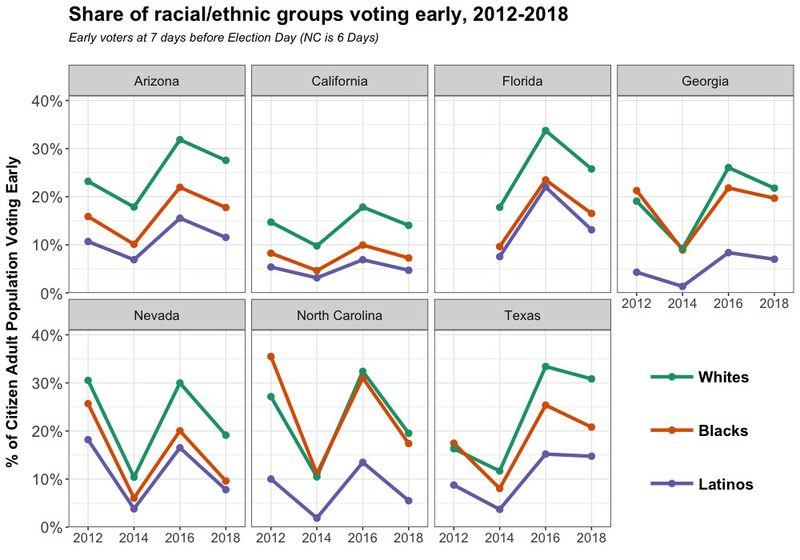 If black and Latino early voting is increasing more than white early voting, for example, that might suggest higher overall turnout for those groups and that Democratic candidates will do well on Election Day too. To draw conclusions about the demographics of who is voting early, we take advantage of official records of who voted as provided by the voter file firm Catalist. As in previous years, Catalist provides detailed information about who has already voted in the November 2018 election and a comparison to the same point in time in 2012, 2014, and 2016. We combine Catalist’s probabilistic estimates of the race/ethnicity of these early voters with state-level figures on the population eligible to vote, using data from the Census Bureau’s American Communities Survey (ACS) and Population Estimates Program (PEP) to project the citizen voting-age population (CVAP) in November 2012, 2014, 2016, and 2018. The first graphic shows the percentage of black, Latinos, and white people who have voted early so far in 2018 compared to what percentage had voted early at this same stage in previous election cycles. As we can see, the percentage who have already cast their ballots is up in every state, and for all groups, compared to 2014. Yet early turnout is only rarely higher than 2012, and never exceeds the rate for 2016. 2018 may feature higher turnout than a typical midterm election, but turnout will almost certainly not be as high as it was in recent presidential elections. Furthermore, there are no clear patterns suggesting especially large gains by any racial/ethnic group, compared to the others. The lines in the graphic generally move in parallel across the election cycles. That said, there are some exceptions to this general rule. One that might work in favor of Democrats is in Georgia. While early voting has dropped among all three groups compared to this point in 2016, the drop among white voters is greater than it is for black and Latino voters. The relatively strong turnout patterns for people of color in Georgia may bode well for the gubernatorial campaign of Stacey Abrams; yet even here, we do not see higher rates of early voting for black people than for white people, like we did in 2012. In Texas, Latino early voting is only down slightly from where it was at this time in 2016, whereas early voting rates are down more among white and black voters. Beto O’Rourke’s chances of pulling an upset over Sen. Ted Cruz will certainly depend on getting higher-than-expected turnout from both Latinos and African Americans, so this is mixed news for that contest. A growing Latino population helps O’Rourke, but if Latino turnout remains low, that population growth won’t be enough to turn Texas purple. Of course, one thing campaigns will want to know is how many of these voters are new to the electorate in 2018 and how many are people who vote anyway but are perhaps voting early this year rather than waiting until Election Day. 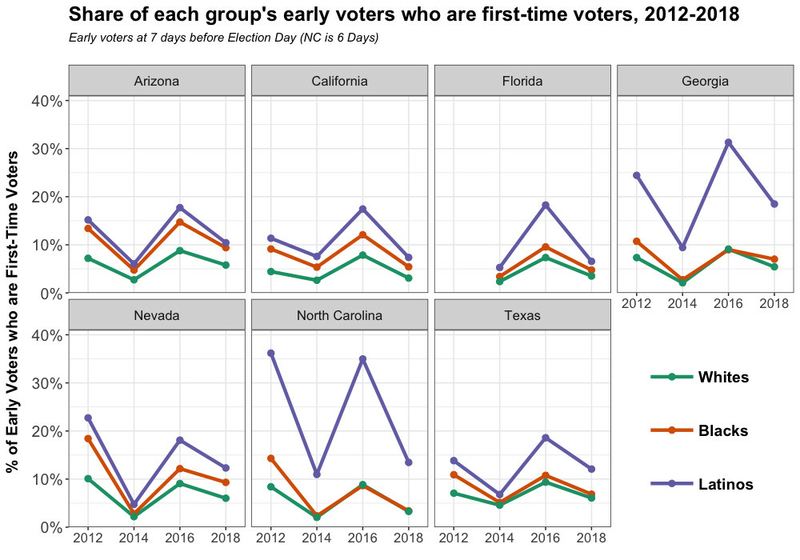 Our second chart delves into this question by looking at the percentage of each group’s early voters who are voting for the first time in 2018. This chart helps illustrate one of the patterns we highlighted in 2016 — Latino turnout surged in that election, and much of that surge was evident in the early vote. For example, more than 15 percent of Latinos who voted early in Florida and Texas in 2016 were first-time voters. Our final chart shows each group’s share of the early vote compared to their size among all citizen voting-age residents. 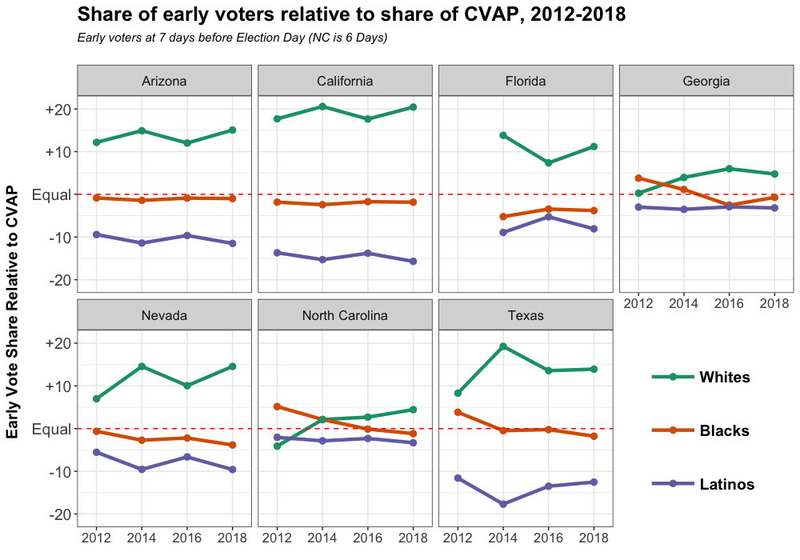 This metric indicates whether a group is “overperforming” or “underperforming” in early voting relative to what would happen if all groups voted at the same rate. In each state, whites make up a much larger share of early voters than they do of the population as a whole. But in some states, that gap is bigger than others. Georgia and North Carolina are both states where participation approaches (though does not achieve) equality. In other states, the gaps are much larger, particularly when we compare white and Latino voters. Overall, expectations of a radically transformed electorate in 2018 are almost certainly overstated, at least when it comes to the racial composition of those who will vote. There are some key states (like Georgia and Texas) where turnout among racial minorities is relatively strong, particularly for a midterm election. But there are others (like California and Nevada) where — relative to white participation — minority turnout looks much like it did in 2014, a wave year for Republicans. There may still be a “blue wave” on the horizon, but it will have to come via an electorate that will not be dramatically more diverse than it was when Donald Trump was elected.